So if you are in the same predicament as I am you should find this article very helpful and useful for your golf game. I live in the northeast section of the United States and if you reside in the north or northeast United States you will find this particularly helpful. 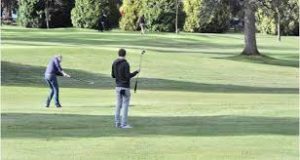 If you are familiar with this part of the country and actually live in this part of the country and you are an avid golf fan as I am, you then know that our golf season in warm weather is not as long as in other parts of the country. So being such an avid golf fan as I am sometimes you have to brave the elements of the weather in order to play golf without having to travel to other parts of the country where the weather is warm pretty much all year round. In this article I am going to try to educate you the best golf tips for winter play when you do not have the resources or the opportunity to take your golf game to warmer climates. One of the most important things you will need to take into consideration when golfing in the fall and winter is absolutely dressing for winter golf. You need to be dressed properly so that you are warm and comfortable when playing in the cold elements. First and foremost you definitely need to keep your head, feet and hands warm. These parts of your body determine how warm and comfortable your entire body will feel during a winter round of golf. There is such a wide variety these days of golf attire for making your winter golf experience much more enjoyable. For instance there are plenty of different styles of golf gloves available by the pair, whereas you get both a right and left-hand glove specifically made for golfing. As far as your head goes there are many a wool hat ( which I recommend ) to keep your head warm. Another very important thing to keep in mind for dressing for winter golf is to dress in thin layers of light clothing as opposed to dressing in big bulky jackets or coats. Dressing in thin layers will keep you warm and also free up your golf swing, also if the day gets warmer as your round of golf goes on you have the opportunity to remove a layer or two of clothing. Last and most importantly is your feet. If your feet are warm and dry your entire body will be warm. This is the reason why a really good pair of golf shoes are of the upmost importance. There are a good deal of golf shoe manufacturers out there but don’t feel overwhelmed by this. 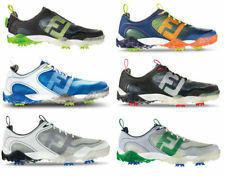 In my opinion the best golf shoe available on the market today is foot joy. Not only are they durable but they are also totally waterproof. The latter being the most important when you are playing golf in the winter. Normally when you begin your winter round of golf the ground is likely to be cold and dry but as the sun comes up and becomes warmer the ground will become wetter. This is one of the main reasons you need a good waterproof pair of golf shoes. One of the biggest golf tips for winter play I would say will be your club selection for any given shot you might happen upon. The only club that you will not have to change would be your driver. As far as the rest of your shots they are going to be a lot of things to take into consideration when playing golf in the winter. The main thing will be the condition of the ground itself in the fairways and on the greens. In the spring and summer you are used to nice plush fairways and nice smooth tightly mowed greens to putt on. At this time of year you may hit your eight iron 140 yards. Come fall and winter when the ground is firmer and not as soft, your eight iron may roll out to 160 or 170 yards. When you are closer to the green and have a wedge shot to the pin you are not going to get the height you normally get with your wedges and when you do hit the firmer greens they are not going to stop as quick as on softer plush greens. All these variables must be taken into consideration when playing golf in the winter. So, as you can see playing golf in the winter may be even more challenging than playing in the spring and summer. One good thing about playing golf in the fall and winter is that the golf courses will not be as crowded as usual. Most courses drop their green fees so it is not as expensive to play. More often than not you will be able to play your round with two balls for every shot you have. This will give you even more practice for your golf swing. I usually don’t even use a score card when I play in the fall and winter. I just enjoy being out in the fresh air playing a game that I love to play. One other thing I forgot to mention is your putting and the green conditions. 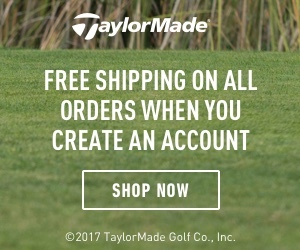 Most golf courses at a certain time of year will stop relocating their pins on the greens, so if you play the same golf course expect the pins to be in the same position every day you play. The greens will also be fast and firm without as much break as usual. Most golf courses, even in the North and Northeast would stay open year round if they could, unfortunately weather conditions usually makes this impossible. I will only play golf in the winter if the temperature is above 35 degrees, not to windy and the sun is shiny. No matter what time of year it is golf is supposed to be a pleasant experience, not going out and try to battle the elements to play. Another reason you should not play below a certain temperature is for health reasons. 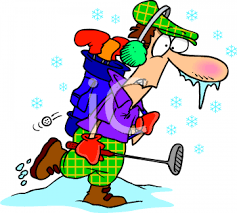 The chances of getting injured increases more and more the colder it is out on the golf course. If it is to cold out no matter how well you think you are warmed up, you probably not. This increases the chance of injury dramatically. The game is meant to be fun and to get seriously hurt. Doing so could also affect your golf game the following season. Believe it or not there are several winter golf options available to you nowadays. 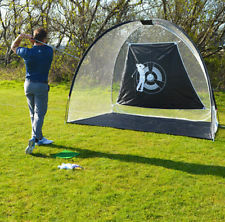 More and more golf driving ranges are now equipped with heated teeing areas where you can hit buckets of ball in complete warmth and comfort. Another winter golf option that I have seen popping up more and more are golf shops that are set up kind of like a bowling alley but instead of bowling lanes, they have golf simulators set up. If you are not familiar with a golf simulator, it is a larger screen with an area where you hit from and you are looking at a golf hole on a large screen. When you hit your ball into the screen and it automatically tracks your ball exactly how you hit, whether a slice, a hook or right down the middle. The beauty of this is you can call for tee times just like at the golf course and you and three other golf buddies can go play an eighteen hole round of golf in the comfort of a warm building. Another great thing about this scenario is these golf simulators can be programmed to play golf courses that you have only dreamed of playing, like Augusta National or Pebble Beach etc. You can also program the length of the course in accordance with your handicap. One other option, although probably not financially feasible for many people would be to purchase your own golf simulator. Years ago this would not be an option for just about anyone but as of late the cost of a decent golf simulator has dropped drastically. You will also need the room to set one up like in a nice size basement or heated garage. Depending on where you do live maybe none of the winter golf tips I mentioned above are convenient to you, you can still keep yourself in golf shape over the winter. The most important is doing your golf exercises on a regular bases, so you do not have to play catch up with your game come spring. One more thing you can do rather cheaply is to pick yourself up a golf hitting net and an old piece of carpet and set it up in your garage or basement and hit some balls that way. Of course putting you can practice just about anywhere.